Today in Memphis, we've got a new Soul Fish, a reason to gloat, some updates on Bass Pro and the biggest TV event of the year (at least, for some of us). If you'd like to show off your Grizzlies valentines (or other Memphis photos) here, tag them #ilovememphis on Instagram. – First, the big news: after 14 straight wins, the Tigers are back in the top 25. 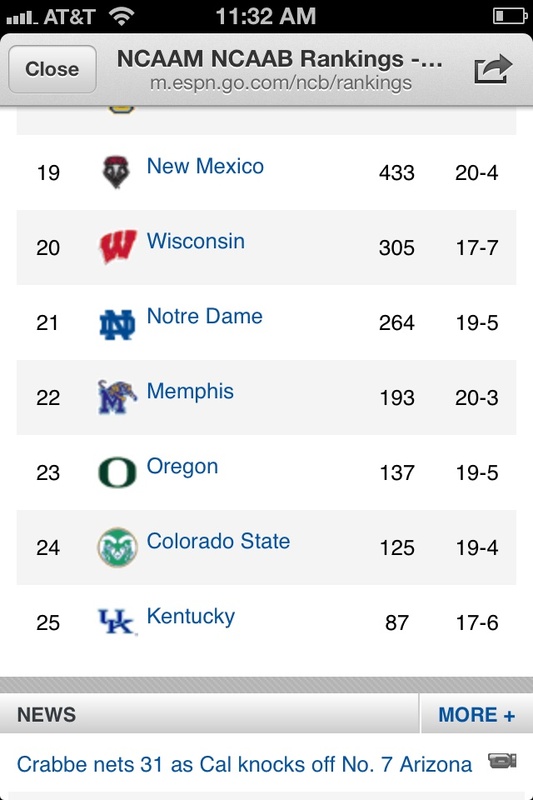 And, I know it was four years ago, but it brings my bitter heart joy to note that the Tigers are ranked 22nd, and John Calipari's Kentucky squad just barely made it onto the list at #25. – This is probably going to be the TV event of the year (at least, for Grizzlies fans): On Feb. 16, SportSouth is devoting an entire half-hour special to Tony Allen and his game day routine. It'll follow him through a day of hanging with his family, prepping and playing a game, and eating at his favorite local restaurants. – Soul Fish is opening a third location on Poplar (near Sekisui Pacific Rim) early this summer. – A Belgian visited Memphis and shot some eerie/beautiful footage of the construction at Memphis International. – Need a last minute Valentine's Day gift? Pick up one of these hand-printed Memphis food maps by local foodie and designer Sophorn Kuoy. – Geoff Calkins tries to answer a very common recent question: How exactly should we feel about Grizzlies owner Robert Pera? – Here's an update on the construction happening at the Pyramid to make way for Bass Pro and its indoor swamp, zip line, bowling alley, aquarium, museum and cabins. – Congratulations to Care 2 Manage and Coyote Case – they were the big winners at the Everywhere Else Startup Conference. One of the top five saddest things about moving to East Memphis AND working in East Memphis was knowing how rarely I'd get Soul Fish. So happy that they're opening up close by!